an advanced age, in Ohio, where for many years prior to his death he had resided. Dr. Skelton was married at Page, Nebraska, January 1, 1896, to Miss Ruby Chase, a native of Iowa, daughter of Perry and Della (Hanley) Chase who were early settlers in Page. Two children were born to Dr. and Mrs. Skelton, Perry and Harold, both intelligent and sturdy young westerners, and the pride of their parents' hearts. Dr. Skelton is a Mason and an Odd Fellow. Politically, he is a staunch supporter of republican principles as expounded by Roosevelt and Taft. Walter Havens, a capable and successful business man of Loretta, is one of the earliest settlers in Boone county and has passed through all the trying experiences and hardships incidental to pioneer life in the west. Our subject is a son of William and Mary Haven, and was born in McLain county, Illinois, on October 19, 1848, he being the eldest of three children. When he was an infant of two years of age his parents moved to Delaware county, Iowa where he received his education and grew to manhood, following farming with his father there up to 1877. On October 1 of that year Mr. Havens came into Nebraska, locating on a homestead on section thirty-four, township twenty-one, range seven, and begun to develop a farm. He passed through pioneer experiences on that place, and succeeded in improving his homestead in good shape, remaining on it up to 1892, at which time he sold the same and moved to Boone, making that his home for a number of years, still farming in the vicinity on rented land. In 1905 he invested in the hotel and livery business in Loretto, and has carried this on since that time -- also dealing in real estate and buying, selling and shipping stock. Mr. Havens has one brother, William who also resides in Loretta, and a sister married and living in Albion. His father died here in March, 1907, while his mother makes her home in Albion, the entire family being well known throughout this part of Nebraska. On January 1, 1867, Mr. Havens was married in Iowa to Miss Nancy Wheelus, and of their union three children were born, Fred, who died in 1881; Minnie, wife of Fred Barnes and mother of three children they living in Loretta; and William A. Havens, also married and living with his family of three children, one mile west of Loretta. Mrs. Walter Havens died in 1875, and four years later our subject was married the second time, to Miss Leora Galyean, also of Iowa, they being the parents of two children, J. Ernest Havens, married and living in Loretta, and Gertie L., who is now Mrs. Harry E. Williams, also living in Boone county. Mr. Havens has been active in local affairs in Boone county since settling here. He has held different township offices, and was for a number of years director of school district number seventy-two. Prominent on the list of prosperous and successful farmers of Wayne county, is the above named gentleman, who has for many years occupied the valuable farm located on section twenty-two, township twenty-five, range three. For more than a quarter of a century, he has been associated with the agricultural interests of this region and has accumulated his property by persistent and honest labor. He is well known throughout the locality, and has gained the highest esteem of all with whom he has had to do. Mr. Splittgerber was born in Prussia, Germany, in 1831, and is the son of William and Christina Splittgerber. He grew up in his native land, received his education there, and was married there in 1852. His first wife died and he was again married in 1874. It was not until he was nearing middle age that he came to America, on account of the opportunities that it offered his family. He came by way of Bremen to Baltimore in 1881, and at once came to the west, where he bought the farm of one hundred and sixty acres which has been his home since that date. He has added to it, until he now owns one thousand, one hundred and twenty acres of land. He has made extensive improvements since that time, and the comfortable home and well-equipped farm now speak eloquently of thrift and good management. In 1874, long before he left Germany, Mr. Splittgerber was united in marriage to Miss Albertina Falk. They were the parents of a large family: five boys and three girls. There were two children by the first marriage, whose names are: Emil and Helen. Those born of the second marriage are: Hugo, Hulda, William, Emma, Agnes, Bernhard, Carl and Gustave. The family attend the German Lutheran church, and Mr. Splittgerber is a democrat. William Buckley, a typical pioneer of northeastern Nebraska, who is respected and esteemed as a public-spirited and upright citizen, is honored as a veteran of the civil war. He is a native of Pennsylvania, born March 8, 1846, a son of James and Hannah (Sanford) Buckley natives of Pennsylvania. His grandfather came to America from England as a young man. The parents spent their lives in Pennsylvania. hundred and Fifty-fifth Pennsylvania Volunteer Infantry, under General Carl Warren, commander Fifth army corps, and received his honorable discharge in 1865. He participated in many important battles and was wounded two times in the battle of Five Forks, Virginia. He was wounded once previously. Upon leaving the army he returned to his former home and engaged in blacksmithing. In 1880, Mr. Buckley brought his family to Nebraska, and took up a homestead in Stanton county. They lived a few years in a ''dug-out," then he erected a comfortable frame house. He has made all needed improvements, and has developed a good stock and grain farm, at the same time doing his share to aid in the upbuilding of his community, and the advancement of educational measures and other movements for the general welfare. He is one of the substantial men of his region, of unquestioned integrity and reliability, and has many warm friends. In 1877, Mr. Buckley was united in marriage with Miss Anna Landies, a native of Pennsylvania, and daughter of William Landies and Rebecca June (Beck) Landies. One child has been born of this union: Hannah Jane, now Mrs. William Mabe. The family reside on section twenty-eight, township twenty-four, range one. James David Mabe, his grandson, makes his home with Mr. Buckley during such times as he is not in attendance at school. H. P. Lichty, an agriculturist of prominence in Antelope county, Nebraska, resides in Eden precinct and is one of those substantial citizens whose integrity, thrift and economy have added so much to the material growth and wealth of Nebraska. Agriculture forms the basis of wealth in that part of the country, as indeed in most sections of the United States. It is therefore of great importance that the class of people who inhabit the great farming regions of the country should represent those elements of sterling worth so prominently displayed by the majority of the early settlers and their descendants. Mr. Lichty is a descendant from Switzerland, his father, George Lichty, having come from that country to America when but a small boy, and, with his parents, settled in Pennsylvania. Our subject's parents were George and Mary (Blair) Lichty, the father was born in 1813, and the mother was a native of Pennsylvania, being born in that state. They came to Iowa in 1854. Our subject's brother was in the civil war, enlisting in 1861 in the Twenty-fourth Iowa Regiment, and was wounded twice. Mr. Lichty was joined in holy matrimony to Miss Jane Miller, and seven children have been born to them whose names are as follows: Jane, who is the wife of Mr. Swan, and has two children; Alexander, who is married to Lizzie Hieter and has three children; David, who married Hattie Napier, has two children; John, married Mable Clifton and has one child; Walter, who married Lulu Bledsoe, and Robert and Flossie. Mrs. Lichty's people were early settlers in Nebraska. Mr. and Mrs. Lichty first lived on the Otoe reservation where Mr. Lichty bought one hundred and twenty acres of land, and while residing there they were hailed out twice. Mr. Lichty with his family then came to Antelope county and took up a claim of one hundred and sixty acres and built a good frame house in which he now lives, and has added to his possessions until now he owns nine hundred and sixty acres of fine land. twenty acres of which are given over to trees. Mr. Lichty is affiliated with the Workman and I. O. O. F. lodges, and enjoys the highest respect and regard of the community. James T. Buchanan, since 1883 a resident of Pierce county, Nebraska, has identified himself with the interests of the eastern part of the state, and by building up a fine farm and lending his influence for good citizenship, he has become one of the deservedly successful and prosperous citizens of his locality. Mr. Buchanan is a Virginian by birth, having been born in Smyth county, June 18, 1857. He is the son of James L. Buchanan, who was born in 1818; the mother was Nancy H. Buchanan, who was born in 1820. During the civil war, Mr. Buchanan's father enlisted in the confederate army, serving three years and was promoted to a captaincy, which office he filled creditably to the cause. In March, 1884, our subject moved to Boscow county, Texas, and in 1888 to Ellis county, where he remained four years, coming to Pierce county Nebraska, in October, 1891, where he rented a farm. He continued to rent until 1908, which he bought one hundred and twenty-two acres of good land, being that part of the southwest quarter of section twenty-four, township twenty-eight, range two, which lies south of the Burlington railroad. Among other misfortunes Mr. Buchanan lost all his crops by hail in 1905. Mr. Buchanan was married October 4, 1874, to Miss Betty Kincanon, and seven children have been born to this union: Ollie, wife of B. A. Thompson; Maggie, wife of Albert Parsons; Leonard, who married Susan Hughes; William Jackson married Verna Moore; Nancy wife of Luther Bolen; Ernest, died in 1901, and Clarence, who is the youngest of the family. Mr. Buchanan takes an interest in local affairs, at all times lending his aid and influence for good government and the bettering of conditions in his community. He is a democrat. Enevold Nielsen, a prominent farmer of Howard county, is one of the men who carries on a diversified system of agriculture in a most successful manner, with results that richly reward his thrift and industry. Mr. Nielsen was born in Denmark, November 16, 1866, and was the eldest child in the family of Niels and Mariane Enevoldsen, consisting of four boys and three girls. When Enevold was a lad of six, the father came to America, going first to Chicago, where he secured employment at his trade as a carpenter, remaining there for a few months, then came on to Howard county. Here he took a homestead on section twelve, township thirteen, range twelve, proved up on an eighty-acre tract and made it his home until his death, in 1906 He was survived by his wife and four children. Enevold Nielsen the mother and his brother and two sisters left Denmark about a year after the father had come to this country, intending to join him in his new home. One daughter died on the trip across, and the others arrived safely at Grand Island in the spring of 1873. Our subject spent his boyhood on the homestead, assisting his father until he was twenty-one years of age, then returned to Denmark for a visit. He spent four months there and upon his return to Nebraska purchased eighty acres of land adjoining the home place, and started to develop a farm for himself. He succeeded in building up a comfortable home, adding to his acreage as he became more prosperous, and now owns one hundred and twenty acres of well improved land on section twenty-four, township thirteen, range twelve. His farm is one of the best equipped and most productive in the locality, supplied with all good, substantial farm buildings, and he is regarded as a progressive and up-to-date agriculturist. Mr. Nielsen was married at his father's home on September 10, 1889, to Annie Petria Petersen, who was born in Denmark and came to this country the year previous to her marriage. To them have been born six children, five of whom are now living. They are named as follows: Christina, Mary, Niels, Martin and Inger, all residing on the homestead and forming a most interesting family group. Niels (1) died when about two and one-half years old. Mr. Nielsen has been active in local and county affairs, helping in every way possible to advance the best interests of his community. He has for a number of years been a member of the school board in district number twenty-eight. Although still a young man, the gentleman whose name heads this personal history has accomplished much in the way of securing for himself a good home and competence, gained through strict attention to his duties in carrying on successfully a thirty-acre farm on section two, township seventeen, range thirteen, in Valley county Nebraska. The greater part of his life has been spent in that state, and he has become well and favorably known to all residing in the vicinity of his home. James A. Brannon was born in Fairfield, Iowa, on December 18, 1868. His parents died when he was but eighteen months old, and he was adopted at that age by Mr. and Mrs. Lemuel Cross, who came into Hamilton county, Nebraska, in 1879, bringing our subject with them, and his early education was acquired in the schools of that county, later attending the Valley county schools, as the family moved to the latter county in 1884. At the age of twenty-one James went into Custer county and pre-empted eighty acres in Sargent township, although he still made his home a part of the time in Valley county with his foster parents. Mr. Cross served all through the civil war. He was a member of Company E, of the Second Iowa Infantry, and achieved considerable distinction as a brave soldier. He died in July, 1881 and left behind him many sincere friends in Hamilton county. His widow now resides at Comstock, Nebraska. On April 19, 1893, Mr. Brannon was married to Sylvia E. Green, who was born and raised in Valley county, a daughter of Joseph and Emeline (Van Horn) Green, they being early settlers in the locality. The father was a native of New York, while the mother was born in Ohio, her parents moving to Clinton, Iowa, while she was a girl. Mr. and Mrs. Brannon have one son, Riley U. Brannon, who lives at home, and also Elsie M., an adopted daughter. The family have a very pleasant and comfortable home, consisting of thirty acres of the original Green homestead, the estate lying one and a half miles south of North Loup. Mr. and Mrs. Brannon are members of the Seventh Day Baptist church. He affiliates with the Modern Woodmen of America, and is a populist and prohibitionist in political views. The gentleman above mentioned has the distinction of being one of the very earliest settlers in the town of Newman Grove, Nebraska. He is also a pioneer merchant of that now thriving city, and at the present time is successfully carrying on an extensive real estate business. Mr. Gutru and his family enjoy the comforts of a modern residence, and are among the prominent members of the social life of their beautiful city. Gulbrandt and Ingeburg Gutru, and he grew to manhood in his native land. In June, 1872, he took passage on an emigrant ship bound for the United States, and landed in New York in due time, going directly to Dane county, Wisconsin, for settlement, there going to work on a farm, and in the winter working in the pine woods. The following year he was joined by his father, mother and the balance of the children, the father taking a farm, and all living together up to 1877, when our subject left Wisconsin and came to Nebraska. Mr. Gutru homesteaded in Boone county, but only lived on the place a short time, then removed to a claim about four miles east of Newman Grove, which he occupied for five years, at the end of that time returning to Boone county, where he again engaged in farming and stock raising. About 1887, at the time Newman Grove came into existence as a town, Mr. Gutru moved there, being one of the original settlers. He at once engaged in the stock business, buying, selling and shipping cattle and hogs, and continued in the business up to 1907. He was also for many years in the implement business there, and was one of the successful merchants of the place. Several years ago he started a real estate office, and has handled many large deals in lands in Nebraska and the adjoining states. Since locating here, Mr. Gutru has been active in the development of the region, and has watched every change that has come to that portion of the state. Mr. Gutru was united in marriage, October 11, 1877, to Miss Ingeborg Oleson, at Newman Grove. To Mr. Gutru and his good wife have been born seven children, two of whom are now deceased the surviving five named as follows: Ida Marie, who is the wife of Archie Robinson; George Henry, a prominent banker of Newman Grove, Marian, wife of George B. Howell, they living in South Dakota, and Lily and Jeanette, living with the old folks. They are a very interesting family, and are honored with the respect and esteem of all who know them. Mr. Gutru and his family occupy one of the handsome residences in Newman Grove, and are popular in business and social circles. The father of our subject is dead, but his mother and two brothers still make Wisconsin their home. One sister lives in Boone county, and a brother is a well-known resident of Newman Grove. Mrs. Gutru's father and mother are deceased, two brothers living in different parts of Nebraska. James W. Johnson, a successful stock and grain farmer of section twenty-nine, township fourteen, range fifteen, Sherman county, Nebraska, is widely and favorably known as a man of affairs and influence in his community. He has spent most of his life in Nebraska, and is one of the younger men among the state's early settlers. Mr. Johnson was born at Newton, Iowa, July 24, 1866, and is a son of Robert and Mary (Watson) Johnson, third in a family of ten children. The father is mentioned at length elsewhere in this work. Five sons -- George E, Walter, Frank, Charles and Ernest -- live in Valley county, Nebraska. Three daughters -- Mrs. Maggie Van Scoy, Mrs. Fanny Sample and Mrs. Kate Paulser live in Valley county. At the age of twelve years James W. Johnson came with his parents to Hall county, Nebraska, where the family remained three years, then moved to Valley county where the father secured a homestead, on which he still resides. The son received his early education in Iowa, and grew to manhood on his father's farm, learning all kinds of farm work. In 1889, he purchased one hundred and sixty acres of land in Sherman county, which he operated for sixteen years, and in 1905 secured the one hundred and forty-acre farm where he now lives. He erected a very comfortable home, and otherwise improved the place, bringing it to a high state of cultivation. He has always taken an active interest in public affairs in his community, and has served many years as a member of the school board, being now director of district number thirteen, and he has also served as township clerk. March 2, 1902, Mr. Johnson married Miss Frances Huckelberry, a native of Marion county, Illinois, daughter of Philip and Matilda (Hewett) Huckelberry, both also born in Illinois. Her father died in Sherman county in 1904, and her mother now resides in Burt county, Nebraska. Mr. Huckelberry and wife had eight children, those besides Mrs. Johnson being: a daughter in Indiana, a daughter in Illinois, two sons and two daughters in Nebraska, and one son in Illinois. To Mr. Johnson and wife three children have been born, namely: Alta M., a student in the St. Paul Business College; Mata, a student in the same institution; and Ellen Marie at home. Mr. Johnson is a populist in political faith. and, fraternally, a member of the Modern Woodmen of America. On his first Sherman county farm, Mr. Johnson lived for eight years in true pioneer style before building a modern frame dwelling. brought about by the exercise of unceasing industry and labor, good judgment and thrift. Mr. Specht is not only an old settler, but is also one of the "native sons" of Cedar county, or very near it, having been born in Jones county, Iowa, about three weeks prior to the start to Nebraska in 1873. His parents, Frederick and Sophia Specht, were Germans, and came to this country in 1869, the trip on an old-style sailing vessel taking six weeks. They came to Iowa at once, and lived there until 1873, when they removed to Cedar county, coming by the overland route. They bought one hundred and sixty acres here, and built a tiny dug-out. Later, a slab house, fourteen by fourteen feet, was built, the walls plastered with clay, and here they lived for ten years. Misfortune attended their early years, in the way of prairie fires, plagues of grasshoppers, and heavy snows. Sioux City, many miles away, was their nearest market at this time, and often during those early days they burned weeds and cornstalks to keep warm, as they had to go twenty-five miles for wood. Despite these discouragements, the family remained, and gained the high esteem and respect of their fellow settlers. The son now farms one hundred and sixty acres adjacent to the old homestead, which he has acquired since his marriage, and he has improved the land and built a comfortable modern home for himself and family. In 1897, Mr. Specht was united in marriage to Miss Sarah Merrick, also a native of Iowa, and to them two children have been born, Henry F. and Edward J. The late John R. Orvis was one of the most prominent citizens of Sargent, and was a very early settler of Custer county, passing through various stages of its history. He was well known as a business man of ability and enterprise, and enjoyed the esteem and confidence of all with whom he had dealings. He was a son of Victor M. and Lucietia (Tyler) Orvis, born in Cattaraugus county, New York, November 27, 1835. He was the eldest of their seven children, only three of whom now survive: Henry C., of Burwell, Nebraska; one daughter in California and another daughter in Iowa. The parents were born in the state of New York, and both died in Iowa. In early childhood Mr. Orvis was taken by his parents to Illinois where he was reared on a farm, and received the usual educational advantages of a farmer's son in those times. Later he engaged in farming, and also conducted a blacksmith shop. He was married in Monroe county, Wisconsin, April 24, 1859 to Miss Chancy M. Sweet, who was of New York birth, daughter of George W. and Malvina (Camp) Sweet, natives of New York. The father served in the civil war, took a homestead in Custer county in November, 1877, and died in North Loup in 1891. The mother died in Sargent, Nebraska, in April, 1910. Mrs. Orvis has a sister in Michigan and a brother in Illinois. Mr. and Mrs. Orvis made their first home on the Illinois farm, where they lived until 1863, when they removed to Fayette county, Iowa, where he established a general mercantile business. In the spring of 1877, they came overland with their six children to Custer county, Nebraska. He secured a homestead of one hundred and sixty acres of land at West Union, and also a timber claim of eighty acres adjoining. This was the home place, and for fifteen years Mr. and Mrs. Orvis conducted a hotel in connection with farming. In 1905, Mr. Orvis sold his farming interests to his youngest son, and retired from active life, locating in Sargent, where he erected a fine home. This was his home until his death, March 23, 1910. He left a widow and eleven children: Clara R. married Henry Groff, and they live in Sargent; Laura E., wife of Elias Whaley, lives in Colorado, and they have five children; Ida M. married Leonard Bisco, and died October 12, 1887, and is survived by her husband and three children; Harris W., died October 1, 1867; Lillie B., is the wife of Joseph Simler, of Sargent, and they have four children; Cinda E., wife of Godlop Zeller, of Sargent, has five children; James A., of Custer county, is married, and has three children; Wilbur R. and Willis J., twins, the former of whom is married, lives in Sargent, and has five children, and the latter died August 25, 1875 ; George V., of Walworth, Nebraska, is married, and has two children ; Burt L., married, and living in West Union, Nebraska, has three children. Mrs. Orvis lives in the pleasant home in Sargent, where she is surrounded by a large circle of friends, and where many of her children are near at hand. Portraits of John R. Orvis, deceased, and Mrs. Chaney Orvis will be found on another page of this volume. 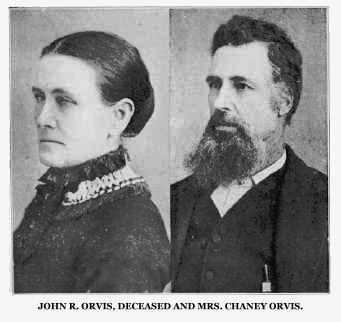 John R. Orvis, Deceased and Mrs. Chaney Orvis. Perseverance and diligence are the steppingstones to success. These characteristics, supplemented by honesty and good citizenship, are among the many attributes possessed by the gentleman herein named. risburg, Pennsylvania, in the fall of 1862, when he returned home. In July, 1866, Mr. Hummel was married to Miss Ursula Jacobs, to which union four children have been born: John, married and living in Central City; Anna, residing at home; Magdelina, also at home; and Chris married and living on the home farm. Mrs. Hummel, the mother, died on the home farm. October, 1890. In March, 1880, Mr. and Mrs. Hummel and four children came to Merrick county, Nebraska, where they purchased land and made a home, selling the same in 1883, returning to Pennsylvania for a four months' stay, then returned to Merrick county, and purchased one hundred and sixty acres of land on section fourteen, township fourteen, range seven, which has remained the home farm until this date, where Mr. Hummel now owns three hundred and twenty acres in the farm and forty acres of hay land. Mr. Hummel and family are well known, and have the respect and esteem of many friends, and are prosperous and successful. One of the very last of the earliest settlers in the old town of Niobrara was the venerable Christian G. Benner, who remained after most of the buildings had been moved away. For over fifty years he was a resident of the town. His death occurred September 3, 1910. Mr. Benner was born near Chillicothe, Ohio, on December 2, 1827. When about seven years of age, the family moved to Noble county, Indiana, which place was then on the frontier of civilization, and made that their home up to 1844, when they again migrated west, settling in Lee county, Iowa, near the banks of the Des Moines river. As a young man, Christian followed rafting and freighting on that stream, also on the Mississippi river, floating logs as far down as St. Louis. In 1848, he went to Appanoose county, remaining for about five years, then removed to Glenwood. In the fall of 1855, he moved to Sioux City, and there, in company with a brother, William Benner, opened the first hotel in the town, the building being a double log structure, and fitted up in a very orderly manner indeed, in marked contrast to the fine hostelries to be found there at the present time. They ran the place for three years, at which time our subject came to Nebraska, landing in Niobrara on the first day of June, 1858. He at first engaged in farming, and during his early residence in the section, freighted across the prairie to Sioux City, and sometimes went as far as Omaha with Mr. Westermann, who was an Indian trader. At one time, Mr. Benner took a six weeks hunting trip up the Niobrara river, when deer, elk and antelope were to be seen on every side. Buffaloes were still quite plentiful, and their hides were a staple article of commerce. During the flood of 1881, Mr. Benner took his wife to the Draper House in order to be out of the way of the worst of the waters, and then turned his attention to the work of rescue, with others, helping save a number of settlers whose homes were submerged. Mr. Benner told the writer that he remembered when the Santee tribe were removed to the reservation east of town, after the massacre at New Ulm, Minnesota. Mr. Benner was married in Centerville, Iowa, on December 21, 1849, to Lorania Fuller, who died in Niobrara, June 9, 1883. Of their ten children, eight survive, only one of whom, William C., is now living in Knox county, and he farms a fertile tract of land lying on the old site of Niobrara. Hugo Vogel, who is now a resident of Fullerton, Nebraska, was formerly a resident of section twenty-six, Loup Ferry township. He is a striking and impressive representative of Nebraska brawn and muscle, having spent almost his entire career on a farm in the great western country. He has passed through all the varied experiences, gaining an enviable reputation as a progressive agriculturist, and is highly esteemed in the locality in which his honorable and useful career is being run. Mr. Vogel is a native of Germany, born January 10, 1845, and is the fifth in a family of eight children, the parents being John and Waldburga Vogel. When Hugo was nine years of age, the entire family, with the exception of one daughter, who died in infancy, came to the United States, landing in New York City on July 4, 1853. They went immediately to North Glosenbury, Connecticut, remaining there for four years, the father engaged in making of fine cutlery. At that time, which was in the spring of 1857, Mr. Vogel, Hugo and one daughter moved into Iroquois county, Illinois, where they purchased a small farm and began mixed farming, being joined by the balance of the family later on in the same year. The father died there in 1860, and the mother followed him in 1876, and there are now living two girls and three boys -- our subject and one brother, Julius in Gage county, Nebraska; another brother Carl in Iroquois county, Illinois, while the sister Mrs. Mary Rosenbaum and Mrs. Augusta Lutz, are now living in Terre Haute, Indiana. first settlers in this portion of Nance county, and passed through all the early Nebraska times. He was elected county commissioner in the same year of settling on his farm, serving for three years, and was also supervisor of his district, which was one and the same office, the system having changed during later years. He has always been interested in the development of the region along educational lines, and was director of school district number eleven for a number of years. On February 15, 1876, Mr. Vogel was married at Paxton, Illinois, to Miss Mary Elizabeth Cunningham, who is a daughter of Philander and Julia Cunningham, and a native of Pennsylvania, her parents coming into Illinois about 1855 from that state. After his marriage, Mr. Vogel started farming for himself on a rented place. One son was born in Illinois, Frederick, he dying in Nance county in 1885, while Harry A. and Helen Louise are both living at home now. Mr. Vogel and his family are well known throughout their section of the country, and are held in the. highest esteem. They have a pleasant home in Fullerton, and a valuable estate, the farm place being supplied with substantial farm buildings, and producing good crops of small grain. He also engages in stock raising, and takes especial pride in keeping his farm in the finest shape, having planted many trees, and also has a very fine orchard. Mr. Vogel is a prominent Knight of Pythias. Although versatility is a striking characteristic of many western men, few have won signal success in as many lines as Dell Akin, editor and postmaster, living at Atkinson, Holt county, Nebraska. At one time or another he has followed the various vocations of merchant, Indian trader, clerk, farmer and ranchman, editor and postmaster, in all of which he has acquitted himself in a creditable manner, showing him to be essentially a son of the west. He first saw the light at Osage, Mitchell county, Iowa, September 23, 1860, a son of Ben F. and Elizabeth (Butler) Akin, natives, respectively, of Pennsylvania and New York. In 1882 the family came to Holt county, and the father filed claim to a homestead on Red Bird creek. As a boy, Dell Akin attended the common schools, and the high school at Osage, Iowa, then one of the best institutions of its kind in that part of Iowa, and in 1877 he came to Holt county, Nebraska, where he opened a small store, trading with the Indians some years at the mouth of Red Bird creek, they crossing the Niobrara from their reservation in what is now Boyd county. At that time Paddock was the county seat, although little business was conducted there. In the spring of 1879, Mr. Akin disposed of his store, and spent two years in Niobrara where he was employed as clerk by various merchants. He was living there at the time of the memorable flood of 1881, and helped efficiently at the work of rescuing those who were marooned. He was awakened by the sound of water, sprang from bed to find himself ankle deep in icy water, and by the time he had taken his soaked trousers from the floor, he was knee deep in the water. As he reached the sidewalk, he was thrown aside by a piece of ice which struck him. He and a Mr. Moore procured a boat, and did noble work in caring for those in distress. One amusing incident was connected with a woman. who, with a child and dog, was sitting on top of a table above the water, and when Mr. Akin reached her, she would not go first, leaving the child and dog, and did not wish to have either of them taken first without her, so he had to take all three on his back, and carry them to the boat at the door. Upon reaching it, he slipped, dumping his load into the boat with such force as nearly to capsize it. The woman's husband had fled at the first sign of danger, making his escape to higher ground, and leaving his family to their fate. One man, too tipsy to care for himself, was found perched on the shelving of the Bonesteel store, and taken away by boat, being too much overcome from the effects of drink to help himself. Soon after the incidents just related, Mr. Akin moved to O'Neill. He had filed claim on a homestead and timber claim, five miles east of the town, in 1879, and lived there from 1881 until 1885, perfecting his title. He then traded his land for a ranch, southwest of Atkinson, lying in Holt and Rock counties, which he owned until 1902, and sold it to invest in land nearer the town. In 1890, Mr. Akin moved into Atkinson, but still operated his ranch, and raised cattle and horses for the market. In 1900, he purchased the Atkinson ''Graphic'' from Lee Henry, and has since ably conducted this sheet as a staunch advocate of republican principles. Since assuming charge, he has greatly increased the circulation, and has one of the progressive papers of his part of the state. He has an editorial page that keeps its readers in touch with the leading issues and questions of the day, and the news department is kept up to a high standard. In 1902, Mr. Akin was appointed to the office of postmaster of Atkinson, taking office in November of that year. He takes an active interest in the campaigns of the republican party, and makes his influence felt at all times, especially when a campaign is in full swing. He is now the precinct central committeeman, and has the confidence of his fellow workers in the cause.